This is one of my most favorite Imaginisce projects I create recently. Many Imaginisce fans might be stopping by because of a post I created on the Imaginisce blog called, 10 Things I Didn't Know About Lori Allred. Since I do the social media and coordinate the Imaginisce design team I thought this would be a fun way to get to know the entire 2011 team, and figured we'd start with me. So check back often this week to learn about the amazingly talented people I have the lucky pleasure to work with every day! Anyway, I found these pictures while I was cleaning up my folders on my computer and realized I hadn't shared them yet. I originally made this fun project using the B-Day Bash Collection from Imaginisce. I then cute the scallop boarder and title on the clear can with brown vinyl using my Cricut Expression. It's been a while, so I can't for sure tell you which carts these are from. But vinyl is still my most favorite thing to cut on my Cricut! Oh the bucket is filled with BIRTHDAY CARDS...made with coordinating papers, etc. And one of my favorite i-rock tool techniques is to add bling to "vinyl" and it worked amazingly on this fun project. I've never tried adding bling to vinyl directly on my wall, so I'll have to get back to you on that one. Thanks for stopping by today. If you didn't come to my blog by way of Imaginisce's blog, then be sure to check out my 10 Things You Didn't Know About Lori Allred post. You too can win an i-rock tool if you leave a comment on my blog today and then return to the Imaginisce blog and let them know you stopped by my blog. Thanks so much for coming to see one of my favorite Imaginisce projects! Not only did I stop by your blog, I followed it too, and I might be the first to comment ! Thanks for sharing, this is such a cute idea. Love the can. I am looking forward to getting to know the design team better. Thanks for sharing. I love the vinyl as well and that the I rock can stick to it. I did come from the imaginsce blog but will follow all the 2011 dt this year I'm addicted lol. It's gorgeous! Love this idea, Lori. Great project Lori!! I need to make some of those. I had fun reading 10 things about you. Have a great week! Following you blog! Cute Can! Can use a few of those at my place for organization! Came here from the Imaginisce blog and I love your blog!!! I like the can project! Can be used for so many occasions. love the chance to win! Looking forward to meeting your new design team and to following your blog! Found you through the Imaginisce blog and got such a giggle about RED being your favorite color...and therefore part of your name!! 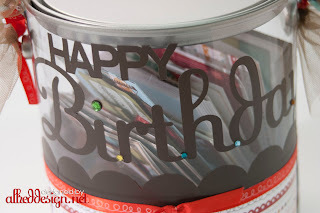 Love the bucket project...great way to use the Cricut vinyl! My mother and I are making necklaces. As I was trying to bling on up this afternoon. I made the comment that I would LOVE to have an I-rock. 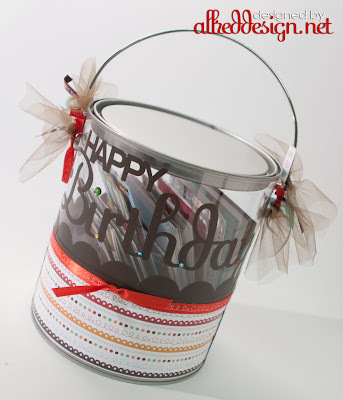 Totally cute bucket and what a great way to store cards, love it!!! I first stopped by the Imaginisce blog (which I do every day), which led me to your blog here. Great idea with the can. You stated you hadn't tried bling on vinyl on your walls yet. I did for Christmas and it works great! It's great to get to "know you" a little better. It appears we have quite a few things in common. I've been following your blog since seeing your awesome projects you did on that tv spot. Love your work! I love your can! I never thought of using vinyl on one! Thanks for the inspiration! This is adorable! Love these buckets! You have inspired me to get more. Cute bucket! I love it. Can't wait to see ,ore of your work. Super cute idea. I never cut vinyl on my cricut. I might have to give it a try. What a cute project! It was fun reading about you this morning! What a cute bucket. Oh, and I love teh idea of "getting to know" you all. Love the can of cards! And I agree about the vinyl, it cuts like butter! loved the 10 Things! Already a follower of your blog. Love the project Lori! And I could use a new i-rock. ;-) I will keep following your blog. Hope to run into you at CHA. Such a cute idea....thanks for sharing Lori.....I love your blog! Thanks for the "Getting to Know You" today! Love your blog and your projects! Love this bucket project! I love that you married a trucker and work with a lawyer, lol how great is that! What a darling can idea! This is a great gift within a gift, and I, too LOVE to cut vinyl with my Cricut. Thanks for inviting us to your blog! I am a new follower! That is a cute bucket! Cute! I need to find some clear cans like that! What a cute container for securing all your cards! Love it! What a great way to store those cards that are waiting to be given away! I like your bling on the vinyl title, which lies much more smoothly on the round can than a cardstock title would, I think. I love the idea of getting to know you all better :) Your bucket is so cute! LOVE it! Getting to know you.... and the song goes on. I love your Bucket project. I am going to have to make some of these and use them for more crafty storage. You always have such fabulous projects! Thanks for sharing. How could you hate nuts?---they are so good. Loved reading your bio on the Imaginisce blog. Great project, Lori! Looking forward to learning more about the other Imaginisce team members. Love the idea of using the bucket to store cards. I may need to steal this idea! Looking forward to more great ideas from you. I just love these little buckets - I use them for gifts and for storage! I have not tried any of the imaginisce products yet :( Hoping to win one :) I am already a follower of yours for a while now. Thanks for sharing this awesome project! Just stopped by from Imaginisce to say hi. Great paint can idea, perfect for gift giving or just to store cards in. I see below you have two talented kids as well. I stopped by from the imaginisce blog, great project! Wow, what a great project. It's been nice getting to know a little more about you. Love this! I never even thought about using my i-rock on my vinyl projects! Thanks for sharing! What a fabulous storage idea for a collection of cards! I love the bling on the vinyl - great idea! Loving getting to know everyone. I have been following your blog and even have the "Christmas subway art" marked to make. I'm waiting on the cart to arrive. Thanks for sharing the files. I'm so excited to be ahead for next year!!! I'm so happy ypu're part of the design team!! Thanks for sharing. I love, love, love the Birthday Bash line. I am already a follower. I found you on the Imaginisce blog last year and have been following ever since. so I just saw your post on the blog and I had to comment(my first one ever, I'll have you know...you should feel special! )I have a real issue with #4 on your 10 things list, and I quote "or talk to my bff ON THE PHONE....EVERYDAY???????" whatever (sad face tear tear.) thought I was the favorite part of your drive. Oh that nemesis... your "BFF"
what a fun project! Thanks for sharing this great idea! Great idea. I can't wait to do this! Great blog too. Great project! I too love reality TV! Thanks for sharing a little bit about you! great project. I don't have an irock but i'd love to win one. I really like you Birthday can, it turned out so very cute! I already follow you. You are the nice lady that emails me when I won something. So you are fave in my book. Awesome project Lori, thanks for sharing it! I already follow both you and Imagininsce. Such a wonderful project! i am a new follower! Love reading the 10 things! excellent! love the bucket!~I've been a follower for a while now! I absolutely love this too! You do such a great job with home decor and things you can wear! TFS. What a fun project, I have one of those buckets to play with but didn't know what to do with it! How fun!! Congrats on an amazing DT!! Wow, it's been a blast checking out everyone's blogs!! Its nice to meet you! I love your ideas. and your headder is really cute! Love your paint can project. I love your bucket. The bling looks amazing on the brown vinyl. Wow - I missed you in this group of intros, and am glad I found my way here - you've got a great blog and I love that card bucket. Awesome bucket idea, enjoyed learning about you! !